Our building is one of the oldest on Main St. and part of it was was once located on High Street until someone back in the 1900s decided to hook it up to horses and pull it to it’s current location. That part of the restaurant today is known as the front dining room. Then, in the 1970s, the main dining area and bar were added. No horses required. The 1980s brought the upstairs dining room. Also, no horses necessary. In between the horse-pull and the additions, Skender and Bruni Leidl made the long trek to Rangeley via Hamburg, Germany and New Jersey. 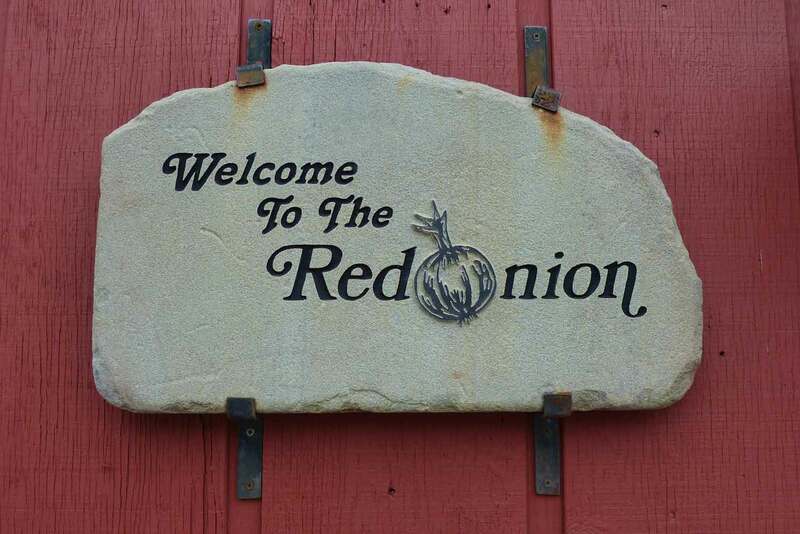 After vacationing in Rangeley for many years, they decided to make one more move to the Maine mountains and purchased The Red Onion in 1970. Today, the Red Onion is still operated by Skender and his daughter, Monika. As a small family owned business, we try to support other small local businesses by purchasing from Maine vendors when we can. The tomatoes on your sandwich are non-GMO, hydroponically grown year-round in Madison, ME. The beef in your chili comes from Maine Family farms. When in season, we buy veggies from local farmers, as well as fresh eggs. We try to reduce, repair and reuse as much as possible. Our fry oil is taken for bio-fuel and scraps left behind are fed to local pigs. We can cater to large groups and tour buses. Be sure to give us a call in advance so we’ll be prepared. We have an awesome patio for outdoor dining in the summer and an outlet to charge your electric car while you eat. Don’t want stop in to eat? Call in your take-out order. We do a great par-baked pizza that you can finish in your oven at home in addition to a full take-out menu. Above and beyond being a restaurant, we love our community and do as much as we can to show it. Do you have a bus tour, birthday, meeting, or a party? We can accommodate. A Hot Commodity, our gift certificates are available anytime of the year. Call us or stop by to give the gift of Pizza or anything else. We have Red Onion tshirts and sweatshirts for sale in the lounge.